I am one of those people that loves a tan, it’s that simple. I enjoy how my skin looks with a sun-kissed glow that not only makes me look healthier but feel better about myself. For years and years now the only Faux tan brand i have used has been Utan & Tone. Utan and Tone is the innovative Scottish brand created by Michelle Mone and manufactured in Britain. Using the best natural and cruelty free products it not only incorporates incredible skincare into each gradual tan product but also combines skin toning and firming properties too. 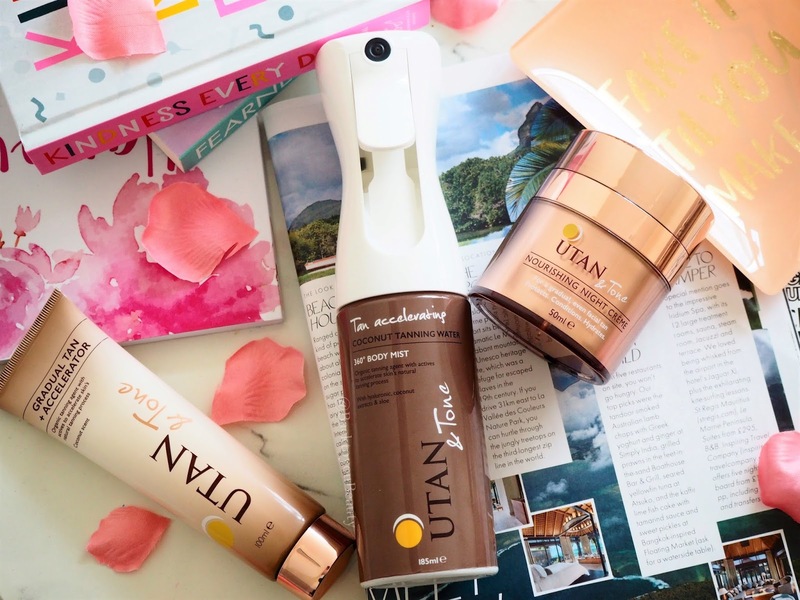 It’s time to say goodbye to that smelly, orange, faux tan of old and embrace the naturally glowing Utan and Tone collection. Summer is coming and it has never been faster or easier to add a glow to your skin. 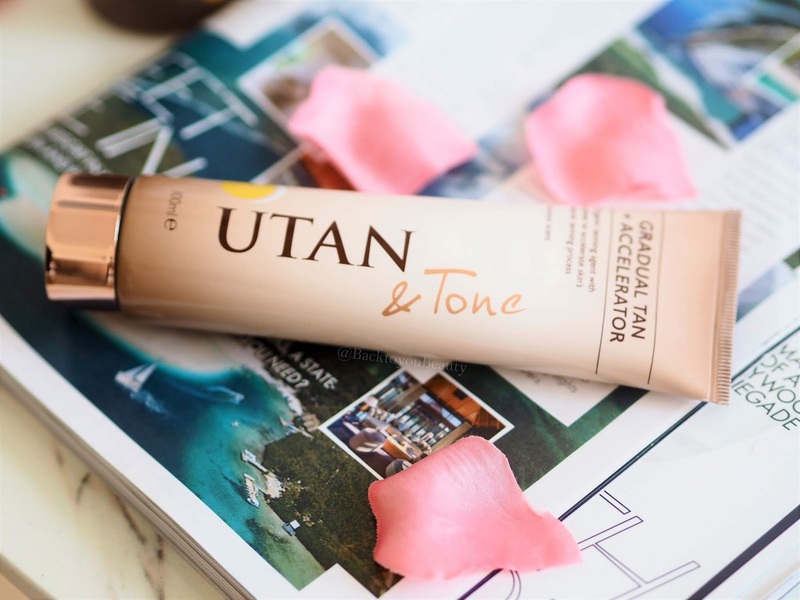 Utan & Tone are launching a very exclusive collection for QVCUK available as a Todays Special Value for one day only or whilst stocks last on 25th May 2018. The collection contains three products that have a non faff approach to tanning and a new and exclusive launch. 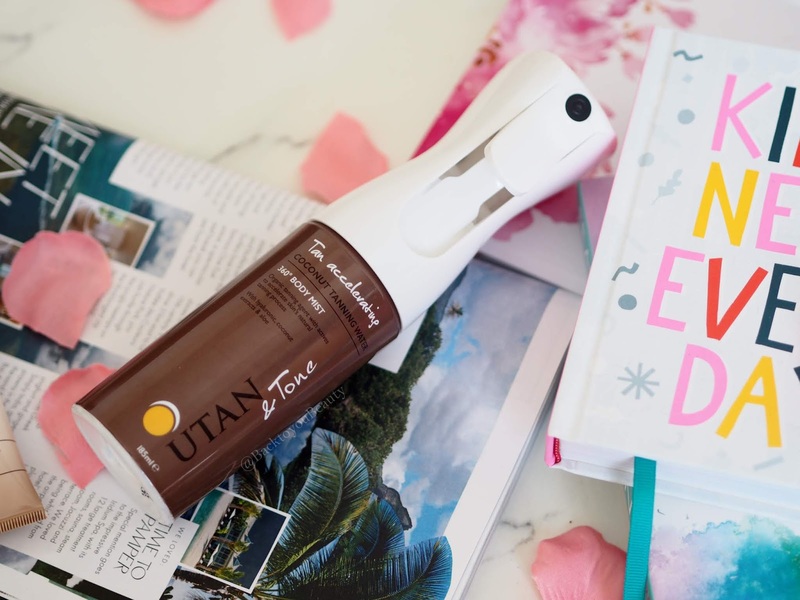 Every body knows that my absolute favourite product from Utan & Tone is the Coconut Water Face Mist (HERE) I literally use it ever other night to create the most naturally pretty glow to my skin. Imagine my sheer delight when i discovered this was now available in a Body Mist! Exclusively launching on QvcUK. Not only does this super fine mist spray bring the most gorgeous bronzed glow to the skin, thanks to the organic self tanning actives, but when used consecutively for 4-10 days it can increase the skins natural melanin production. The revolutionary tan activating ingredients used are proven to reduce UV induced redness and dehydrated skin whilst prolonging and enhancing a natural tan. Winning product in my book. Easy to use 2-3 times per week, you literally press and spray. Thanks to the unique 360 degree angle, every part of the body can be covered. Containing Cocoa and Coconut extracts, Hyaluronic Acid, Soothing Aloe and a Natural tan accelerator, not only does this product smell absolutely amazing, but it makes the most gorgeous body lotion. Silky upon the skin, it melts in quickly and easily leaving no sticky residue behind meaning you can dress quickly. Perfect to use 4-10 days before sun exposure and also as your body lotion whilst on holiday, these leave a lovely glow and hydration to the skin that lasts all day. There is absolutely no biscuit smell what-so-ever just a wonderful scent of coconut. If you really want to maintain a fabulous tan or encourage your own gradual glow, this is great to use on the days you are not using the Tan Accelerating Coconut Tanning Water. For beautifully glowing skin, this is a Summer must have. Enriched with antioxidants and Vitamins C, B5, B6, B9 & K this feels like a beautiful, luxurious night cream which is full of hyaluronic acid to deeply nourish and hydrate the skin. This feels really nourishing on the skin and does not smudge off onto the pillow. Super easy to use, just press down the air tight, cushion top which dispenses a pre-measured dose and apply evenly over the face avoiding your eyebrows, and massaging carefully around the jawline and hairline. This would be my night product to keep an existing tan topped up as I did find that upon cleansing my face in the morning some of the product disappeared, so for that reason I wouldn’t count on this product alone to give me a faux tan, but for use throughout the summer or on holiday this would be perfect. This collection is perfect for anyone that wants an easy to apply Summer tan that looks natural, leaves the skin looking healthy and fresh and lightly scented with Coconut. Obviously SPF must be applied at all times when out and about in the sun and always wash your hands after applying any of these products. As someone that has happily used Utan & Tone products with absolutely no streaking or running, for many years, this is a collection that i would highly recommend. 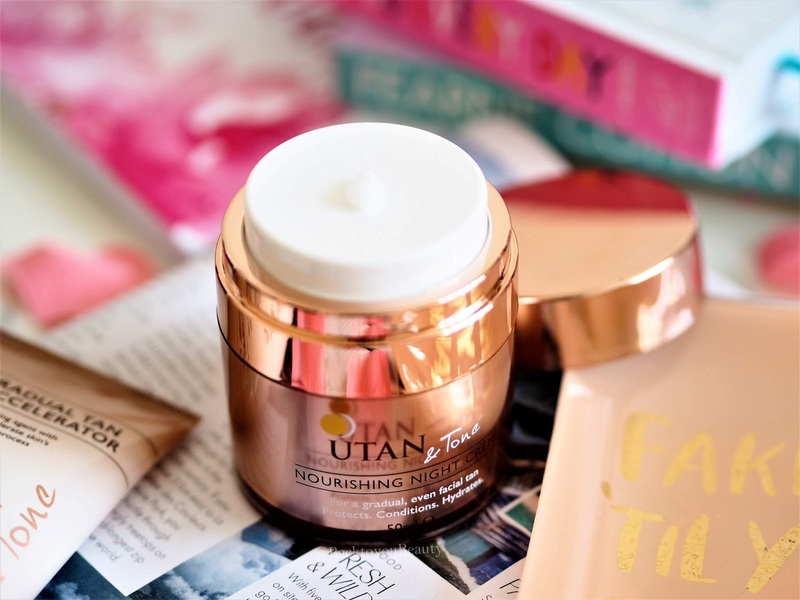 Have you tried Utan & Tone? I have many more products from the brand that i will be featuring over the Summer, if there is a product in particular that you love, let me know below. "Tried & Tested : Shampoo and conditioner from High End to High Street for all hair concerns"
"Lancome Launches two new Genifique Yeux products!" I'm not the biggest fab of fake tan but I can't help but love the idea of the coconut water body mist. I love the idea of an easy self tan so the body mist sounds perfect plus I love the smell of coconut so sounds like a winner. These sound lovely for a natural look. I am already quite tanned, but my legs need a bit of help! I do love fake tanning but I have to admit I’m lazy with it!